The Nato Secretary General, Jens Stoltenberg, has marked the alliance's 70th anniversary with a rare address to the US Congress. "Nato has been good for Europe but Nato has also been good for the United States," the former Norwegian prime minister said to applause. He said that Nato did not want a new Cold War but it "must not be naive" about relations with Russia. The North Atlantic Treaty Organization was set up to defend against the USSR. Back to a nuclear arms race? Questions have been raised about its continuing purpose since the communist superpower collapsed nearly three decades ago, with Russia its successor state. US President Donald Trump has frequently accused Nato's European members of not paying their fair share of the defence burden. Mr Stoltenberg told Congress: "This has been the clear message from President Trump and this message is having a real impact." What exactly did Stoltenberg say about Russia? He urged Russia to return to the Intermediate-Range Nuclear Forces Treaty which it is abandoning after Mr Trump said he would take America out, accusing Russia of violations. 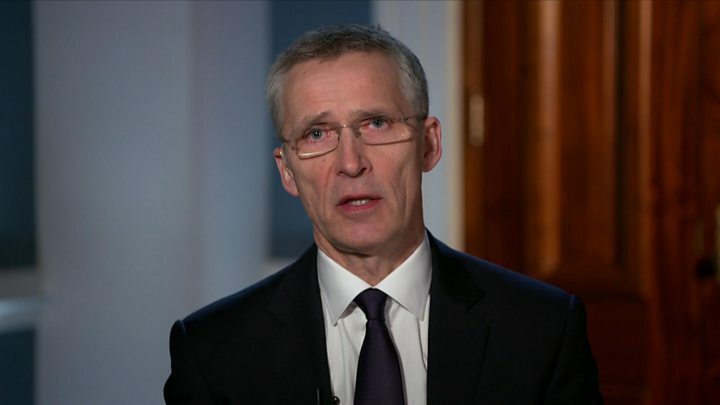 "We do not want a new arms race," said Mr Stoltenberg. "We do not want a new Cold War. But we must not be naive." 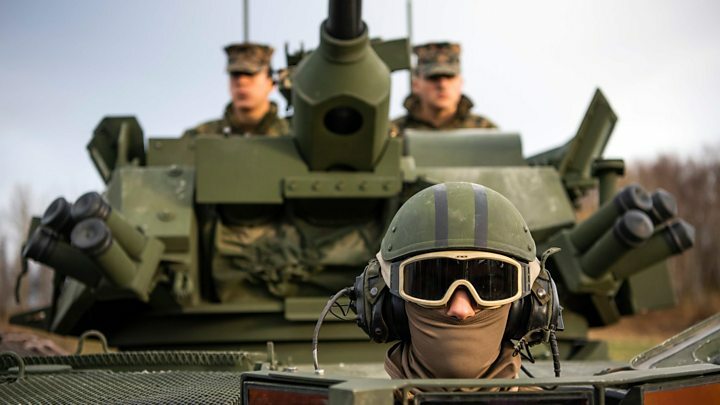 Nato, he said, had "no intention of deploying land-based nuclear weapons in Europe" but would "always take the necessary steps to provide credible and effective deterrence". He commended Nato as "not only the longest-lasting alliance in history [but] the most successful alliance in history". Jens Stoltenberg only mentioned the American president once but his speech was clearly a ringing defence of Nato in the face of Donald Trump's scathing attacks on the alliance. Mr Trump's views are shaped by his trademark transactional approach to foreign policy. He believes the US has been taken for a ride by "freeloading" Europeans benefiting from the American security umbrella without investing enough in their own defence. He has taken credit for a recent "rocket launch" of increased military spending amongst members, and Mr Stoltenberg has given it to him, making the best of a tense situation. Officials and lawmakers on both sides of the Atlantic agree that the payment gap is a valid concern, but they are alarmed by the ambivalence Mr Trump has shown towards the value of the alliance, and the mutual defence commitment at its core - the first time in 70 years an American president has raised such doubts. Mr Trump is even reported to have mulled over withdrawing from Nato, which is structured around the defence of Europe. Notably Mr Stoltenberg emphasised how the alliance benefited America, not only Europe, a view shared by members of Congress and of Mr Trump's administration. 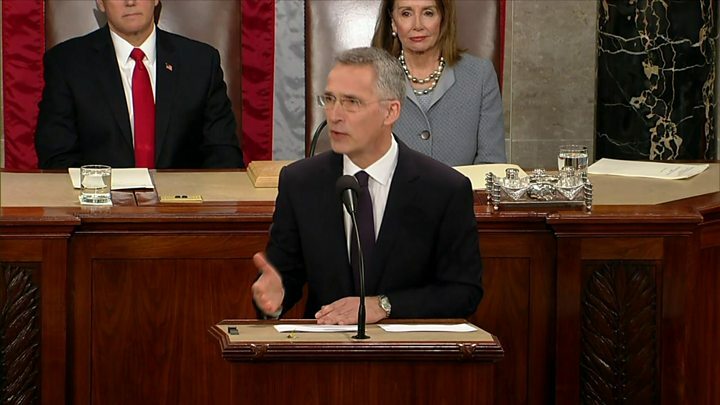 Lawmakers gave Mr Stoltenberg repeated standing ovations, their way of reaffirming America's commitment to Nato.